The Mongeard family arrived in Vosne Romane?e in the 18th century, and records show a Mongeard working as vigneron for Domaine de la Romane?e Conti in 1786. Baron le Roy, Marquis d’Angerville and Henri Gouges purchased the entire 1945 crop and that was when Gouges encouraged the young Vincent Mongeard to personally bottle the wines, rather than sell in barrel. His son Jean took the helm from 1976 to 1995, expanding the domaine’s holdings to 33 hectares in 35 appellations while also returning to more traditional winemaking processes such as bottling without filtration. ‘Les Dames Huguettes’ comes from 35-year-old vines; the harvest is hand sorted at the winery and 100% destemmed. A recommendation direct from the domaine, pair with a scented beef Carpaccio or a lamb mignon with a coriander crust. Label I.Q. 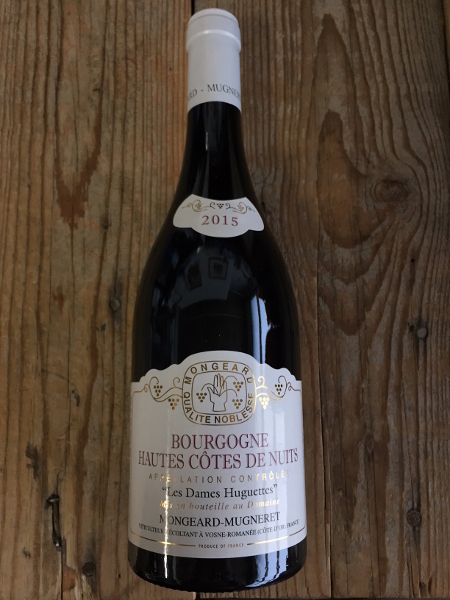 : The Bourgogne Hautes Côtes de Nuits AOC covers the entire sub-region, none of the small 16 communes within the sub-region are named on the labels.